The club have announced that the early bird season ticket offer which expires on 31 May has been extended and supporters can now purchase tickets between 10:00-16:00hrs on Monday 2 June. This is because the Deva Stadium ticket office is not open at the weekend. Vauxhall Motors striker Paul Taylor looks set to join Chester this week after the two clubs finally agreed a fee for the 22-year-old player. The Blues have twice had offers declined for the promising forward but talks have been ongoing for several days and it looks like a deal has finally been agreed. On The Borderline update pages for the 2007/08 first and reserve teams can now be downloaded from the history section of the site. Manager Simon Davies has made his first signing of the season as 32-year-old Hugh Griffiths joins him as assistant manager. 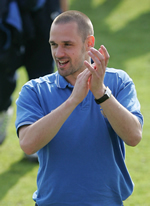 Griffiths was previously working as assistant to Peter Davenport at Southport, leaving just before the end of last season. 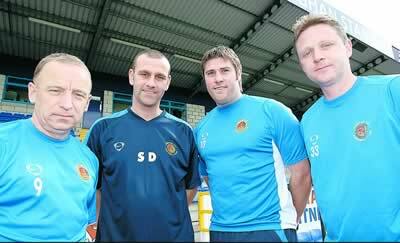 Chester have also promoted reserve coach Billy Gerard who will now take on a similar role with the first team squad, and have appointed Julian Owen as their Fitness and Conditioning coach. City have had their offer for Vauxhall Motors striker Paul Taylor rejected. Manager Simon Davies is now expected to look elsewhere for a striker to partner John Murphy for next season. The Blues are reported to have tabled a £30,000 bid for Vauxhall Motors 22-year-old striker Paul Taylor. This is the second time City have bid for the player after the Blues had a £50,000 offer rejected in the January transfer window. Taylor scored 18 goals for the Motormen who were relegated from the Conference North last season. Chester have confirmed the following pre-season friendly matches. 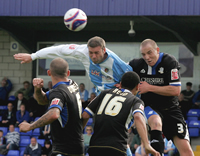 The League Two fixtures for 2008/09 wil be published at 10:00hrs on 16 June. Good news for City fans as Paul Linwood has signed a new improved two year contract with the club and is expected to be named captain for next season. The news comes after a week of talks between manager Simon Davies and the defender voted Player of the Year by City fans. One player who doesn’t look like he'll be coming to City is ex-Wrexham and Tranmere Rovers defender Carl Tremarco. The club had been linked with him earlier in the week but have withdrawn their interest as the player appears uncertain as to where his future lies. The club have announced details of the Season Tickets and matchday prices for 2008/09. Matchday seat prices for next season have been reduced by £1.00 to £15.00. Juniors under-16, OAP’s and full-time students will be charged £10.00 for admission to any area in the stadium. Joint adult and juniors under 14 years of age, can purchase individual combined match tickets for a price of £15.00 in the West stand. The cost of home terrace has risen by £1.00 to £15.00. There are also large increases in Season Ticket prices for juniors as well as a 25% increase in a car park pass. Manager Simon Davies has begun rebuilding his squad for next season by releasing seven players. Davies held individual meetings will all players concerned before announcing that goalkeeper Phil Palethorpe, defenders Simon Marples and Sean Hessey, midfielders Dean Bennett, Tony Grant, Adam Walker, and striker Simon Yeo would not be retained. Two further players, defender Kevin Sandwith and striker Chris Holroyd are considering new offers from the club. It’s also reported that three of City’s promising young players Paul McManus, Shaun Kelly and Paul Rutherford have all agreed new terms and they will officially sign new contracts shortly. It’s reported that club owner Steve Vaughan is to appear in the Magistrates Court at Chester today after being arrested. He is charged with a public order offence, using threatening, abusive or insulting words or behaviour. Details are yet to be finalised but Chester City are expecting to include home games against Swansea City and Carlisle United in their pre-season schedule this summer, the Blues also have fixtures against Southport and AFC Telford United in July. Two players from the youth team, Andy Mitchell and Glenn Rule, who have turned out for the first X1 this season have been rewarded with full professional contracts by manager Simon Davies so congratulations to them both. The City players who are out of contract this summer are: Phil Palethorpe, Simon Marples, Kevin Sandwith, Dean Bennett, Sean Hessey, Tony Grant and Simon Yeo. Whether any will play a part in Simon Davies’ plans for next season remain to be seen. Both Paul Butler and Tony Dinning, who were dropped from the squad in the final weeks of the season, are expected to move on. Relegated from League One today were Port Vale, Luton Town Bournemouth and Gillingham. Promoted to League Two from the Blue Square Premier are Aldershot Town who will be joined by either Burton Albion, Cambridge United, Exeter City or Torquay United. City failed to score for the fourth successive match as the disappointing season ended with a 0-0 home draw against Macclesfield Town. City hardly troubled the visitors all afternoon with Richie Partridge missing the best of what chances there were on ten minutes. The Blues finished the season third from bottom of a division they looked like topping in October. The alarming slump from there cost manager Bobby Williamson his job in early March. Since then the Blues have won on just one occasion in 12 attempts, picking up seven points and scoring just six goals. On the plus side the defence kept a third successive clean sheet, just when they needed it. Davies’ first important task now will be to name an assistant manager and to appoint a new youth team manager, the position he vacated. His main priority for the squad will no doubt be a striker and though he has a few players in mind no names have (rightly) been mentioned. The players will take a few weeks off now before they report back for full time training on 1 July. Davies plans to bring the players in for a couple of days a week prior to that date though. Congratulations to Paul Linwood who picked up the Player of the Season award prior to today’s game with Macclesfield. HOLROYD SET FOR FINAL RETURN? Chris Holroyd (left) could return to the City side tomorrow as the Blues wrap up a roller coaster season with a home game against Macclesfield Town, kick-off 15:00hrs. Holroyd has had a lengthy lay-off with a hamstring injury but could feature tomorrow as Kevin Ellison remains sidelined with a thigh injury that kept him out of Tuesday night’s clash with Stockport County. Macclesfield are expected to name a youthful starting X1 as manager Keith Alexander uses the occasion to look at several of his squad that he has yet to see play. The Blues are looking to complete the double having beaten the Silkmen 2-1 at Moss Rose back in September with goals from John Murphy and Laurence Wilson. The club have announced that Cestrian Trading are to be the new shirt and stadium sponsors from next season. The shirt deal is for two years while the stadium will be renamed the Cestrian Stadium in a five year deal once the paperwork has been finalised. Cestrian Trading are another of owner Steve Vaughan’s companies and describe themselves as an international trading company, importing/exporting throughout Europe and the Middle East and specialising in the trade of mobile communication products and CPUs. The announcement comes a couple of days after UK Sameday announced that they would no longer be sponsoring the club after three years of unquestionable support to the club. 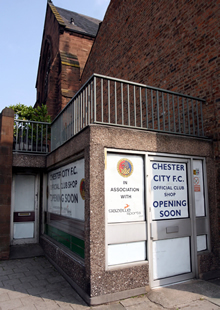 The club have announced that they have received planning permission to open a shop in the city centre. The location is the bottom of Watergate Street in the former post office premises. The club have had a shop in the centre of town before many years ago in Grosvenor Road. City fans will be hoping that the new venture will be up and running in time for the new season. The shop will be run in conjunction with a company called Gazelle Sports.